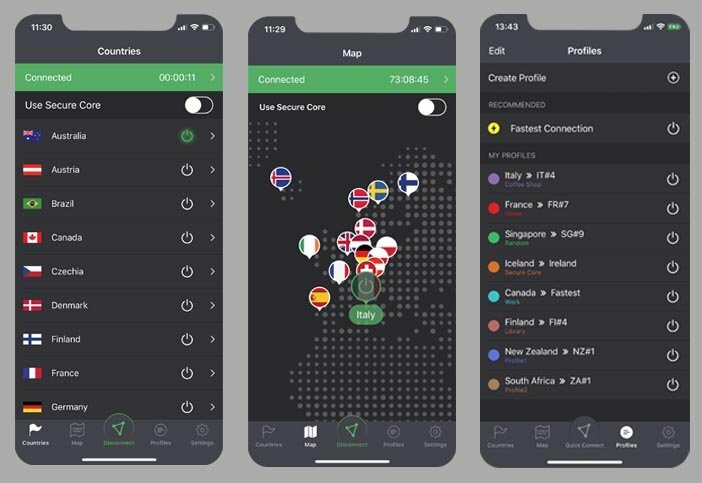 One of the most popular free VPN services, ProtonVPN, has just launched a brand new app for the iOS devices. And same as for the other platforms, there is a quite comprehensive free plan which includes 3 countries and 1 device. No limit on the data transferred which is very cool. ProtonVPN is one of the few reliable free VPN providers. It is based in Switzerland and has a clear business model – freemium. That also means from time to time you may see offers to upgrade to a premium plan which starts at $4 per month. Currently, ProtonVPN ranks #3 in our list of the best free VPNs, just after TunnelBear VPN and Hotspot Shield VPN. ProtonVPN for iOS is something users have been asking for a long time. In October ProtonVPN announced a public beta version and a few weeks later launch the app officially on the App Store. The big disadvantage of using the ProtonVPN iOS app is the need of having an account. You need to enter your e-mail and submit the activation code which you will receive. You also need to create a username which is a bit old school and almost no one is using usernames these days. The free plan is limited to connecting only to 3 countries – Sweden, Switzerland, and Iceland. Even though you see all available countries in the list, you will always be connected via one of those three. The good thing is there is no data limit, so you can download/upload as much as you want. It also offers advanced features like Kill Switch (beware, it’s not enabled by default), profiles, or ProtvonVPN Secure Core. Using the app is super simple and connections seem to be very fast. During our testing, we haven’t seen any of the 3 servers to be overloaded. ProtonVPN is definitely a solid solution and deserves your attention. To download ProtonVPN to your iPhone or iPad simply go the App Store or visit the official website. If you are thinking about upgrading to one of the premium plans, make sure you will do this via the official website. The website pricing is roughly 20% cheaper due to no fees to Apple. With the premium plan, you will get access to all countries, multi-device support, and P2P connection support. ProtonVPN for iOS is a good choice if you are looking for a free solution. It provides a good level of privacy and will keep you safe on public Wi-Fis. However, keep in mind the free version requires registration and can be used only on a single device. The connection speed is decent, even though you can effectively connect only to 3 countries. The iOS app is simple, fast and easy to use. It offers advanced features like Kill Switch, profiles or ProtonVPN Secure Core technology. Overall one of the best free VPNs for your iPhone or iPad. Previous ArticleCyber Month Offer: Get HideMyAss and Save $324 – THIS MONTH ONLY!